Mackerel, straight from the sea to the BBQ, WOW! A first this week, we have never caught Mackerel before but we were on a roll catching 6 in total. The hard part was finding a sheltered anchorage so that we could cook them on the BBQ for lunch. And then, whilst waiting for the coals to simmer down we also caught a cod. Fresh fish and salad for lunch followed by melted marshmallows on sticks, what a way to spend our last day. The beginning of this week started with a bit of deja vu and reminder of last week. A flat calm motor to Vettoya followed by a brisk sail to the Lofoten. Overcast and rainy – atmospheric – as we proceeded to Trollfjord and then when we exited Raftsund and anchored in Brottoya voila, the sun came out and stayed for the rest of the week. Sadly along with the sun coming out, the wind disappeared so we had a fair bit of motoring to do. However, this allowed us to visit lots of new places and take fabulous reflection photos. We saw puffins, black guillemots, eagles, dolphins, sealife that I thought were pilot whales, one lone seal and Jim is convinced he saw a Minke. Wonder what is in store for us next on our last trip in the Lofoten for this season – glad we are coming back next year. Whilst Britain was basking in fabulous sunshine and watching Andy Murray win at Wimbledon, Velvet Lady was battling the elements in 40 knot squalls in Trollfjord! The high pressure centred over UK giving you the nice weather was pushing a series of low pressures further north giving us some distinctly wintry weather!! This was definitely a trip where the itinerary was totally dictated by the weather. Unsettled weather makes route planning difficult as we always have to think 3 days ahead to ensure we stop in places sheltered from the predicted gales and at the same time not get stranded too far north of Bodo. It all started so peacefully with a flat calm motor to our favourite island Vettoya where we spotted several eagles soaring above the cliff tops. We continued north gybing downwind in Force 5-6 to a peaceful anchorage in Engeloya, reached across to Digermulen in a Force 6-7 and then headed north via Trollfjord to Lonafjord at the north end of Raftsund. By the time we were anchored in Lonafjord the wind was Force 7 gusting 8, and the following day was spent at anchor in the safety of Lonafjord as the wind blew force 8 gusting 9 outside. Sheltered anchorages are deceptive, you can never tell when the wind has gone so late afternoon we ‘poked our noses out’, only to be rewarded with a 40 knot squall and scuttled back to our familiar anchorage for a second night. The wind was often accompanied by rain, and when we realised waiting for the rain to stop was going to mean no sailing the catch phrase of the week soon became, ‘same plan with coats on’! As quickly as it came it went, and during the second half of the trip we had a good mix of Force 3- 5 before the grand finale on the last day and a short 9 mile beat to Bodo in another Force 6. 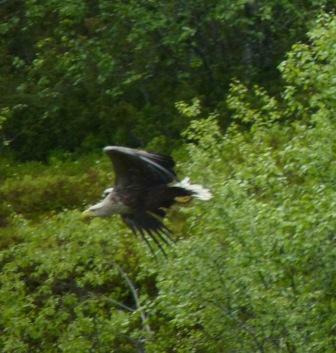 Despite the weather we managed to sail 305 miles, take photographs of stunning sea eagles, climb to the top of 3 hills, collect crabs and shells on the beach, pick wild cloudberries and one night even see the midnight sun. We also played a few card games, read a lot of books, laughed and joked about the weather and had a sing song with Tony’s song sheets. So, when the weather is bad what do the guests think? Add to all this the ability to conjure up hearty and fancy meals on a galley stove what more can one ask for – Better weather actually- Many thanks. The weather varied from blue sky, sunshine, 27 degrees, no wind and shorts weather to driving rain, good wind, fog and 10 degrees and anywhere in between. Luckily there were more nice days than rainy days. We quickly learnt that the forecast was unreliable and were forced 3 times to abandon plan A and go for plan B (but never had to resort to plan C) – all good lessons in seamanship for those on board! That’s sailing for you – the weather never stopped us sailing, just a lot of the time we were making good use of our oilskins. We visited 5 ports and 6 anchorages during our 9 days sailing, in addition to starting and finishing in Bodo. We had a beautiful evening for our evening in Haversand and Elizabeth caught a fish which was promptly wrapped in foil, put in the oven and served for dinner. It was warm enough to swim on two mornings, with Josh and Elizabeth both braving the Arctic waters, there were 3 hills to climb all giving spectacular views. It was the week of the midnight sun and we were determined to see it. This required no cloud and an anchorage that had clear views to the north. We clearly saw the midnight sun after our BBQ in Brottoya and just missed it due to cloud on our penultimate night in Landegode. As usual cameras were at the ready, and we saw our share of wildlife including our first sighting of an Arctic Hare. We still have one male space and one female space left on the 11 night trip from 17 – 28 July but apart from that we are full for the summer. The good news is we have decided to definitely come back here next summer and will publish the programme in the Autumn. Sign up for our newsletter to be sure to get the programme as soon as it is available.